Unlike his predecessors Democrat or Republican, Mr. Clinton transferred primary legal authority for approving export licenses for advanced U.S. technology from the security-conscious State Department to the politically conscious Commerce Department for the purpose of making such exports easier. Mr. Clinton is also the first and only president to approve an export waiver authorizing two companies — Loral Space and Communications and Hughes Electronics — to transfer technological secrets in the face of a criminal investigation involving their prior alleged export violations. Mr. Clinton approved personally the export of their data relating to satellite- and missile-launch technology to China over the objections of his secretary of state, the Pentagon and others. JERUSALEM — Defense Minister Binyamin Ben-Eliezer met with Chinese Ambassador Pan Zhanlin in Tel Aviv Monday to discuss the cancellation of Israel’s sale of the Phalcon advanced radar system. Ben-Eliezer appraised relations between the two countries and glossed over the affair. “We have to see it as an incident inside the family and not as a crisis between two states,” he told Zhanlin. Ben-Eliezer promised to work to strengthen the defense ties with Beijing. Zhanlin told Ben-Eliezer that he believes China knows how to overcome the difficulties and strengthen the ties, according to a statement issued by the Defense Ministry. China is fully prepared to cooperate with Israel.” [Emphasis added]. 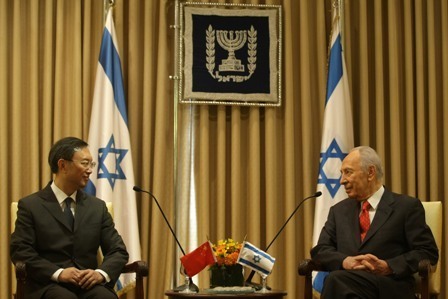 In 2009 a new Israeli consulate was established in Guangzhou, capital of the flourishing Guangdong province, where much trade between Israel and China is undertaken. Against such a background of Sino-Israeli relations, that a major Chinese documentary on the wonders and glories of Israel is to have such an extensive airing among the Chinese people and over such a duration of time, launched with much ado by leading Israeli and Chinese luminaries, it seems pertinent to ask whether there are major developments afoot in regard to extending Sino-Zionist collaboration. Rabbi Jacob S Raisin, Gentile Reactions to Jewish Ideals, (New York: Philosophical Library, 1953). Soong’s Jewishness is assumed by the fact that Sassoon “only employed Jews,” according to the Jewish Encyclopaedia, 1944. The Columbia Encyclopaedia, Sixth Edition, 2002 Columbia University Press. E C Knuth, The Empire of “The City”, (Milwaukee: Knuth, 1946), reprinted 1982, no further publication details, 45, 46, 82. “Israel, China Celebrate 10 Years of Diplomatic Ties,” People’s Daily, January 25, 2002. Guang Pan, “China’s Success in the Middle East,” Middle East Quarterly, Vol. IV, No. 4, December 1997. Guang Pan is professor of political science and history at the Institute of European and Asian Studies in Shanghai, and director of the Chinese Society of Middle East Studies, with a special interest in Jewish, Middle Eastern, and international studies. Victor Ostrovsky, By Way of Deception: The Making & Unmaking of a Mossad Officer, (New York: St Martin’s Press, 1990), `26. “Clinton Administration Presses Israel to Stop Aiding Red China,” New York Times, November 11, 1999, 1. “Israeli-Chinese military Co-operation is Bad for America,” Howard Phillips, ibid. Mark Levin, Washington Times, May 27, 1999, A1.